NO MATTER WHERE YOU ARE ON LIFE'S JOURNEY YOU ARE WELCOME AT ST. PAUL'S UCC (Stoverstown). 10:15 am: Intergenerational Worship. Generally our worship ends between 11:15 am and 11:30 am. We also worship on Christmas Eve, on Wednesday evenings in the seven weeks prior to Easter, and after sunrise on Easter morning. 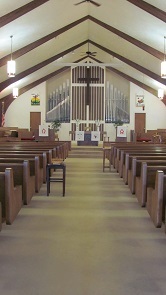 St. Paul’s UCC (Stoverstown) is an inclusive community of faith. Our congregation is a theologically diverse group of people who come from West York to Hanover to worship together. We profess a faith based not on fear, but rather on God's inclusive love for all people, which we have experienced and understood most clearly through Jesus Christ. Worship at St. Paul’s UCC is an opportunity to come home—emotionally, spiritually, and socially. In our congregation, we all lead busy lives, but Sunday morning is time we dedicate to ourselves, to God, and to one another. It is a chance to find belonging and a peace that the world cannot give. Whenever we gather to worship God, we understand that both the people with speaking roles and those with listening roles are the performers, and God is the only audience. We love worship that is intelligent, reverent, relevant, and stirs all the senses. We also love worship in which we can both laugh our heads off and cry our eyes out, knowing that tears are a sign that the Holy Spirit is with us. Lay liturgists (non-ordained people) at St. Paul’s UCC play an essential and significant role in every service of worship: reading scriptures, sharing their own faith stories, and preaching occasionally. Our children are with us every Sunday for All Ages Worship. Our wider church, the United Church of Christ, affirms that each generation has the blessing and responsibility to “make the faith its own.” At St. Paul’s UCC, we do this with worship that really speaks to our modern, everyday lives, while tapping into time-tested, deep, and ancient practices. Our front doors and main entrance to our worship area face our upper level parking area. Nursery care is provided during worship year round. Our nursery is located immediately behind our worship and gathering area, and has a large window facing the worship area. Children’s ministry for pre-school and elementary-aged children is provided during the school year at 9:00 am. Children also enjoy a welcome and active role in our worship. 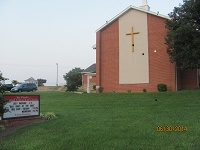 The congregation of St. Paul's United Church of Christ (Stoverstown) is committed to providing a safe and secure environment for all children, youth, and adults who participate in the ministries and activities sponsored by our church and other community activities hosted by our church. Our Safe Sanctuary Policy is a living document and has been updated to incorporate the new Pennsylvania Child Protective Service Laws effective, January 1, 2015. The following guidelines reflect our congregation’s commitment to preserving this church as a safe and sacred place for all who enter its doors so all can experience the love of God through relationship with others. Our worship area, gathering area, meeting room areas, and restrooms are all wheelchair accessible from our upper entrance. 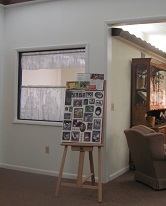 Our fellowship hall, kitchen, and a second set of restrooms are all wheelchair accessible from our lower entrance.